Heart On The Line: The package arrived!! Ever since I found out that Melissa's parents mailed us a package I've been stalking the front door! It finally arrived at about noon and I couldn't be more thrilled with it's contents! I'm blown away by their generosity! 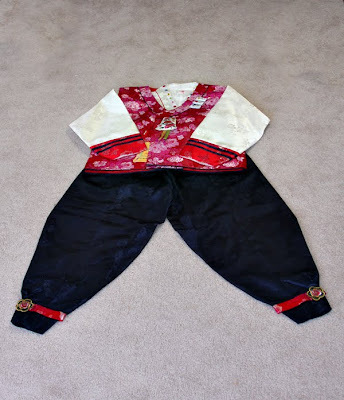 She sent Josh and Matthew absolutely GORGEOUS hanboks. 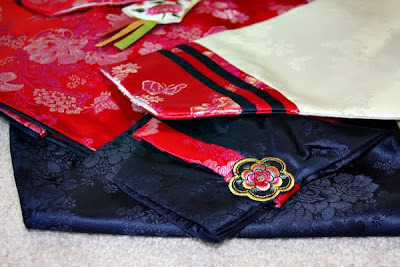 Hanboks are traditional Korean outfits that Koreans wear on certain holidays and for special occasions. 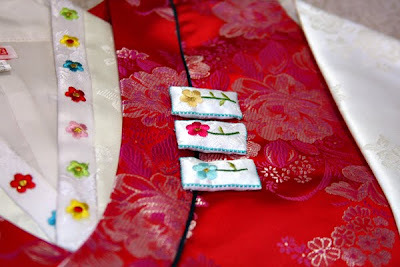 They're made of silk with very intricate embroidery and designs and they're absolutely beautiful. We looked at lots of them while we were in Korea and I even thought about buying one for Josh and Matthew but I never did. Melissa's parents were really happy when they found out that we're having a Dol party for Clarissa. 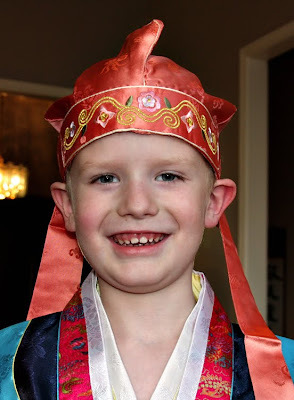 A Dol (or sometimes spelled Tol) is a traditional Korean first birthday party. Long ago when Korea was a very poor country, babies often died before their first birthday, so when a baby lived to their first birthday they celebrated it with a really big party. It's become an important tradition to Koreans and to this day every baby gets a special Dol party when they turn one. 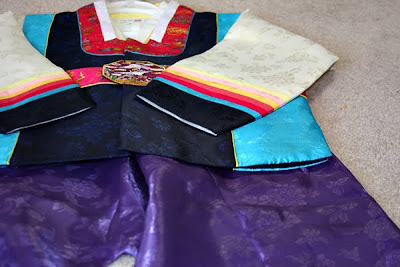 I'll be talking more about the specifics of Dol parties as the big day gets closer, but my point of the story is that Dol parties are one of the events where hanboks are traditionally worn. 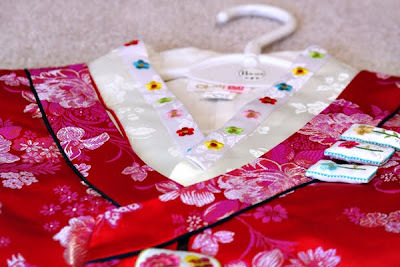 Clarissa has a beautiful hanbok that was given to us by her foster mother but Melissa's parents were concerned that Josh and Matthew wouldn't have a hanbok to wear to the party, and Melissa also didn't have her hanbok for the party. So today the package shows up on my doorstep and they bought beautiful hanboks for the boys and they sent Melissa's hanbok. They also sent Clarissa a Korean childrens TV show on DVD, they sent me and Shawn a Korean movie and they sent a bunch of Korean food, like instant ramen, some herbal tea and seaweed strips like the ones we ate in Korea. For someone who loves all things Korean as much as I do, getting that package today was like Christmas morning! I've been giddy about it all afternoon. 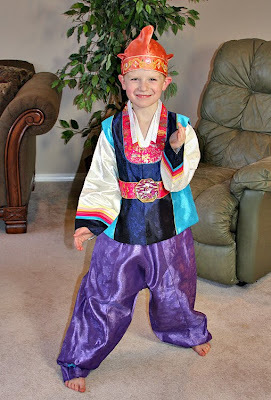 The kids aren't home yet, but they're going to be really excited to see their hanboks when they get here. I was so excited to find your blog and hear your story! My husband and I have three biological children and are now adopting a little girl from S. Korea. We received our referral in December, and are hoping to have her home around Easter. This is such a time of excitement, but also a time for worry and stress! It's so fun to read of your experiences and hear how wonderful things are going for you! Thank you!! That is so cool to have such a fun tradition. The outfits are very nice - and I imagine that they are fun to wear - especially when it's only for a special occasion! 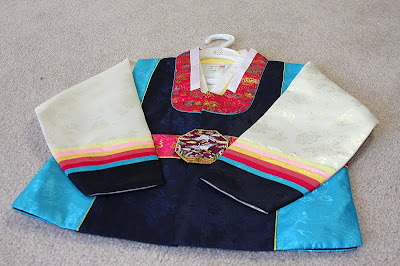 What beautiful hanboks! 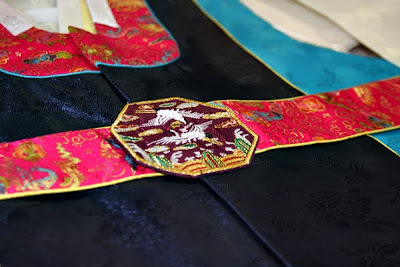 The embroidery is amazing and the colors are stunning!